In case you’ve missed it on Instagram, I am absolutely obsessed with this top. (examples one, two, three, four). But really though, I have it in 2 colors and actually just bought it in a third (although I’m not sure I’ll keep it because maybe I should chill a little?). But whatever the case, it’s been a MAJOR hit this season – for me and with y’all too it seems from clicks, likes, and sales! It’s the perfect throw-on when you want to look polished but not try too hard. I love that this blouse — though classic — has just the right amount of on-trend details to make it fresh and exciting. Peplum sleeves are HUGE this spring and this blouse makes it a must in your wardrobe. Since it is now a closet staple for me, I wanted to share 3 different ways I’ve worn it recently. My favorite is wearing it with all white. 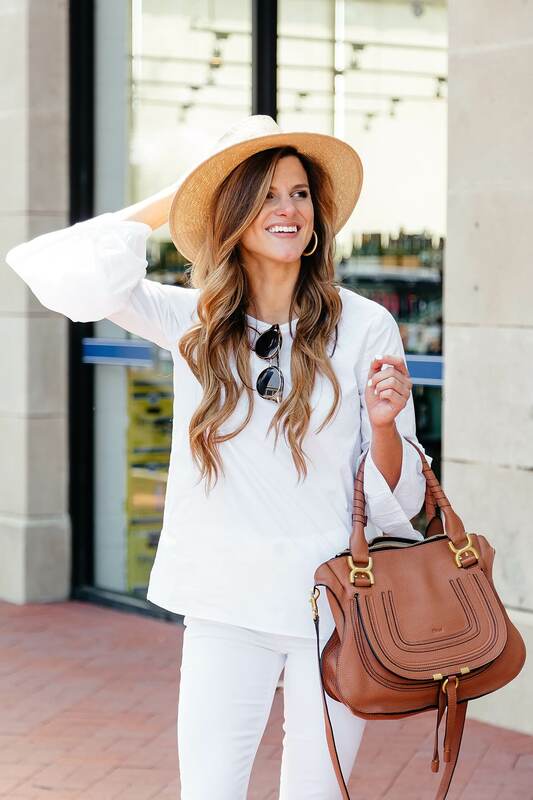 Something about a crisp blouse and top to bottom white looks very chic. I love the pop of cognac to add a little color. I also shared my travel outfit (on Instagram) to Mexico a few weeks ago where I wore it almost the exact same way and you guys seemed to love it! The second way I’ve worn this top is tucked into a simple pair of high-waisted shorts I recently picked up at Club Monaco (one of my FAVORITE stores EVER!). I love their FIT, especially when it comes to shorts, skirts, and pants. I also wore it with shorts when I took over Sole Society’s Instagram – see the full outfit here! Pairing this top with shorts is easily something you can wear to lunch with girlfriends without looking over-dressed to the occasion. Which one is your favorite? How would you have styled the top?! And are you as big of a fan as I am? !